1625. Fresh out of Gascony, D’Artagnan, a young man whose ambition is to become a musketeer for the King – Mousquetaire du Roy – becomes acquainted with Athos, Aramis, Porthos and the beautiful Constance, linen maid to the Queen. Soon he finds himself at the heart of an adventure where France’s destiny is at stake. You are rewriting the story! 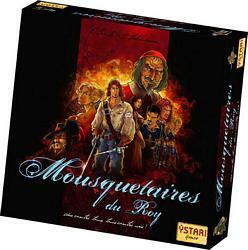 But will you choose the side of the Musketeers or of Milady on this adventure?